Looking good is important to every one of us. It is a well-known fact that if we think that we look good, it influences how we carry out our daily tasks. Looking good boosts our confidence and allows us to get on with our daily tasks with vigor and enthusiasm. The opposite is also true, when we feel uncomfortable with ourselves, we tend to shy away from responsibility, and we do not put our best foot forward in our day to day life. Hair grows from a follicle and is mainly built from keratin (the same substance that is in your fingernails). It consists of three layers, the cuticle (outermost layer), medulla (middle layer) and cortex (innermost layer). Damage can happen when these layers are altered either physically or chemically. This damage causes dryness, and eventually, the keratin is dissolved causing the hair to thin and become brittle. Damage comes from many sources, some self-inflicted and others are health reasons. In the self-inflicted camp are things like excessive washing with harsh soaps and shampoos, constant use of heat appliances like hairdryers and curling tongs, long-term use of harsh chemicals such as bleach and long exposure to harsh environmental conditions such as sunlight and chlorinated water in swimming pools. Damage can be caused by some health issues such as a thyroid complaint, malnutrition and anorexia nervosa. The cost of professional treatments can be prohibitive but fear not there are many remedies that use ingredients that are already in your kitchen or available from the local store. 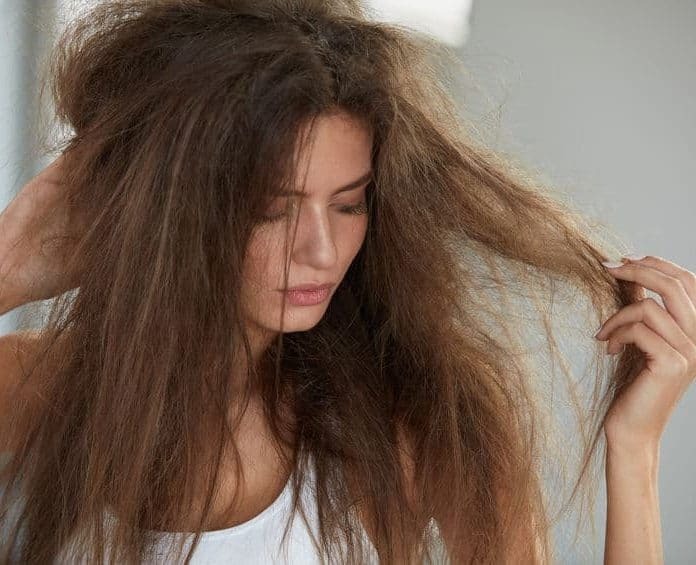 These remedies can have a huge impact on the condition of your hair. Let’s have a look at some of these home remedies that can improve the condition of your hair. Yes, that same oil that is so delicious as a dressing on your salad will also work wonders on your damaged hair. This oil has a high proportion of fatty acids, loads of Vitamin E, and many antioxidants, so it works well to seal the cuticle and preserve moisture in the hair. With the cuticle sealed, further damage from the environment is prevented. Take enough olive oil to thoroughly saturate your hair, and place in a small bowl. Gently warm this oil in the microwave or place the bowl over a pot of boiling water. The oil must not be hot it must be a comfortable, warm temperature. Slowly pour the oil over your head, gently massaging the oil into your scalp and rubbing it on the hair all the way from scalp to tip. Cover your head with a warm towel and leave the oil on your hair for at least 30 minutes. Wash the oil out with a gentle shampoo and condition as normal. Use this treatment once a week for a head of soft, shiny hair. Olive oil is a natural oil similar to jojoba oil, sesame oil, rosemary oil or sweet almond oil. You can use any of these natural oils in the same way as olive oil to achieve the same result. Try them and see which one reacts best with your hair.